All throughout summer, we will continue our journey onward. 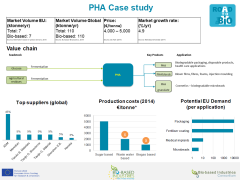 In this newsletter, we present the results of our latest events, ask for your view on key barriers for bio-based chemicals and dig a little deeper into a group of chemicals that have received special attention in our discussions, the dedicated polymer chemicals. ­ On June 19, the RoadToBio consortium invited stakeholders from the chemical industry, academics, NGOs as well as governmental bodies to a workshop in order to discuss key barriers on bio-based chemicals and products and to validate the business cases that will be included in the roadmap. Discussions were lively, and a lot of input could be gathered from the 20 participants of different stakeholder groups. To round out the process, a webinar was held on July 11 to present initial results and conclusions of the workshop and to give stakeholders who were unable to attend the meeting an opportunity to participate. ­ In the course of the project, a number of “sweet spots” were identified - bio-based chemicals with a high potential to replace fossil-based chemicals by 2030 and to increase the bio-based product share in the chemical industry. Of these sweet spots, 9 were selected for detailed analysis in so-called business cases. The idea was to select different bio-based chemicals and illustrate specific advantages and disadvantages of bio-based production, highlight hurdles that have to be tackled and discuss strategic approaches how to overcome these hurdles. Based on the selected variety, we hope to receive a multitude of insights that allow us to draw conclusions for the diverse field of bio-based chemicals. We invite you to take an active part in the project. With the provided survey on key barriers for bio-based products you have the opportunity to give us your opinion on which hurdles hold back the bioeconomy. We would be most thankful if you take up the opportunity to participate in the development of the roadmap. ­ The mere fact that a product is bio-based is often not sufficient for a successful market entry. Bio-based materials must have additional characteristics in order to have a real chance to compete with conventional products on the market. It therefore makes sense that dedicated chemicals and polymer-based dedicated chemicals received the most attention during our workshop – these chemicals offer new and improved functionality for end products. Lactic acid is a nontoxic and biodegradable polymer with a low price and several marketable applications. 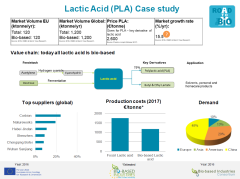 Lactic acid is the cheapest among the biodegradable bio-based polymers but in order to increase its volume, new applications and/or improved recycling characteristics are required. At the current state, however, this potential is not fully exploited and lactic acid is primarily used as a monomer for plastics. In order to become successful and sustainable in the market, ways must be found to recycle this polymer. If this is achieved, market share is predicted to soar. PHA is the fastest degradable polymer studied in the project. Therefore it is particularly suitable to be used e.g. as slow releasing fertilizer application or as filler or rheology modifier in home or personal care. The molecule has been known for a long time, but the optimal application is still being researched and investigated. Once one of the promising leads has been developed to a commercial stage, a significant increase in market share can be expected. A special case we are considering within the project is PEF. This polymer has the potential to replace the widely used PET as a plastic in the packaging industry. With its high mechanical strength and better barrier properties, it seems possible that less amount of PEF can achieve similar characteristics of PET, leading to cost advantages and light-weight products. 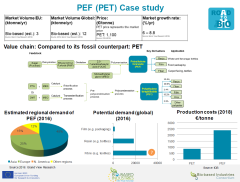 Whether the market entry of PEF will be successful depends, among other factors, on potential recycling processes for PEF. The alternative could be the production of bio-PET which is as of yet more expensive than PEF. Strong demand for recyclable bio-based polymers: This requires sorting and separation technology for plastics mixtures and/or the establishment dedicated recycling streams. e.g. waste streams instead of sugars. ­ If you are interested in finding out more about the results, you can listen to the webinar, download the slides on our website or contact the consortium directly. ­ After the summer break, in our September’s newsletter we would like to share with you some of the key finding from the development of the business cases for drop-in and smart drop-in bio-based chemicals. We will present the case studies of bio-based ethylene, methanol, 1,4 butadiene and dodecanedioic acid, and assess the business opportunity that these chemicals could potentially represent for Europe. Read our next newsletter to learn about barriers and opportunities for drop-in and smart drop-in biobased chemicals. Learn how will these business cases help us develop RoadToBio roadmap.